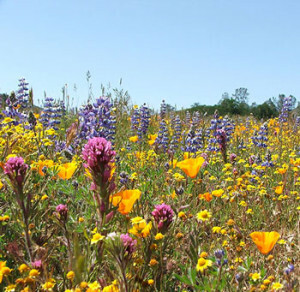 Between this fall and next Spring, we are setting out to create a 2 acre wildflower extravaganza on The Ojai Meadows Preserve. 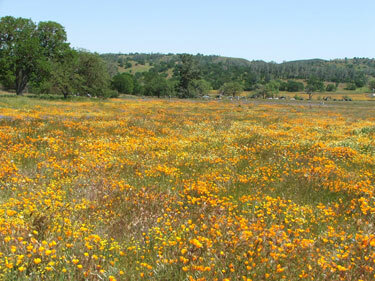 In our ongoing effort to restore a variety of habitats on the Preserve, our next phase is to convert our weedy uplands into native grasslands and oak woodlands painted with wildflowers. This season we will start our first section where we will plant native grasses, oak trees and WILDFLOWERS. In order to get wildflowers where the weeds live today, we need a substantial human effort. Throughout this fall and winter we will be working to exhaust the weed seed bank on a 2 acre site where, in the spring, we will cast seeds for native grasses and a diverse selection of wildflowers. Our long-term goal is to have such a vibrant wildflower show that people will come from near and far to see it each Spring. On top of all that, we have over 1,500 trees and shrubs to plant along the waterways at the Preserve, so we can mix up the weeding and the planting for variety. The result will be nothing short of magical!…but don’t take my word for it. Hear what local plants and wildlife are saying about the project. We are seeking a cadre of volunteers to help with this effort. If you are interested in helping us achieve our goals, please contact me – Brian Stark, Conservation Operations Director, and let me know when you are generally available (during the week, weekends), and the best way to get in touch with you. We will have activities planned during the week and on occasional weekends and I’ll follow up with everyone to set some dates. The beauty we can create together will be a lasting gift to the community. I am interested in volunteering for this project, if you still need help. I am more available on the weekend. Have you set any dates yet?